The 720 DSP conveniently combines CATV, DOCSIS 3.1 Cable Modem, and Gigabit Ethernet testing along with 802.11 b/g/n wireless in a single meter for troubleshooting and installation of both residential and business services. 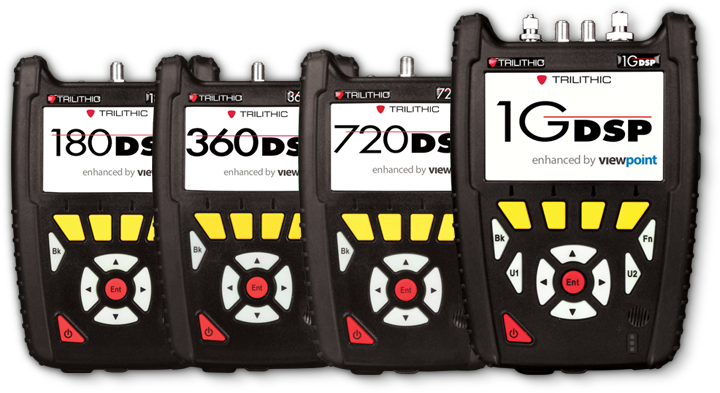 Trilithic’s 720 DSP conveniently combines CATV, DOCSIS 3.1 Cable Modem, and Gigabit Ethernet testing along with 802.11 b/g/n wireless in a single meter for troubleshooting and installation of both residential and business services. Multi-service verification can now be achieved with one instrument containing everything needed for service, business, or residential installations. Eliminate the need for multiple instruments in most business services with Gigabit Ethernet Throughput testing and save capital expenditures at the same time. Tailored for the challenges faced by installers, contractors, and service techs, the 720 DSP comes equipped with all of the powerful troubleshooting tools for the experienced tech, yet helps simplify decision making and streamline standard processes and procedures for the more novice tech. This results in more efficient technicians, greater overall system health, and allows techs to continue using the same meter as they become more experienced. Used in combination with other 720 DSP or 1G DSP field analyzers or the 2401 TLB headend Ethernet loopback device, the 720 DSP can achieve throughput testing speeds of up to 1 GbE using a dedicated test port. The 720 DSP can perform either roundtrip or one-way measurements of Key Parameter Index (KPI) for full Ethernet service testing. With constant payload testing for Layer 2 through Layer 4, the 720 DSP is built for verification of both Ethernet Service Level Agreement (SLA) and Quality of Service (QoS) metrics with support for BERT and Loopback testing standards. The 720 TDR includes a built-in test port for time-domain reflectometer testing of coaxial cables within active CATV systems. The new 720 TDR allows technicians to troubleshoot active plant without the side effects of an FDR, which operates in the frequency domain, instead of the time domain. The step-type TDR that is featured in the 720 TDR includes a measurement range of over 2000 meters with a zero dead zone and an accuracy of 0.5 meters for cables at any length. This meter is ideal for technicians who need to identify and locate impairments in coaxial cable, such as poor splices, water intrusion, pinched coax, poor quality cables, impedance mismatches, and bridged taps. The 720 DSP features an intuitive, color touchscreen interface, simple pass/fail indicators, and powerful autotest apps to streamline certification and make the technician’s job easier. Everything about this next-gen meter was built with the business technician in mind—from the long battery life and quick charge time, to its unique, built-in LED flashlight and glow in the dark keypad for those dark, cramped spaces. With its next-generation smart device technology, the 720 DSP is the easiest to use, most feature-rich, and best-performing meter available for installation and troubleshooting of business customer accounts. Providing the widest range of functions for an installer available today (as standard options), the 720 DSP includes virtually all the testing options an installer or service technician needs to verify service quality and easily identify and fix problems in the field. The DSP features next-generation autotest applications that practically walk the technician through a job. By performing standardized measurement tests at various required locations on the job site using user set test plans, channel plans, and limit sets, the meter very clearly indicates (using color and symbols) what areas still need attention, before the technician leaves the job site. Multi-user support allows technicians that work in various territories to easily switch channel plans, standardized autotest apps, and test limits or login as a completely different user. 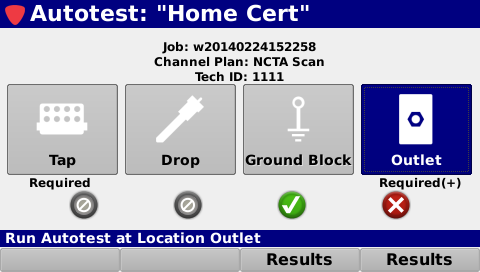 Connecting to ViewPoint allows techs to upload job data in near real-time as well as transmit and receive channel plans, autotests, and firmware. Leaving less room for entry error, this new simple user interface can translate into less training and more efficient time in the field for techs. The DSP comes equipped with all of the required troubleshooting tools for the advanced technician, it also offers a higher comfort factor for novice technicians, reducing decision making in the field, which can ultimately result in more productive work days and more satisfied customers. Field operations managers can now easily verify that all of their technicians are performing the proper tests and are doing so at the right place and time—in near-real time. The potential benefits include identifying techs who need additional training, improving team performance, reducing truck rolls, and cutting operating costs. At a higher level, ViewPoint can deliver simple, standardized, system-wide reports and dashboards that can help a director or VP of technical operations view the entire operation at a glance to gain information that can be used to reduce service and repeat trouble calls. Essentially, this integrated system approach allows cable operators to see much more of their certification operations and use the information in practical ways. The insights can enable them to identify both localized problems and high-level system issues to make decisions based on a clearer understanding of their overall operations and the associated ROI. 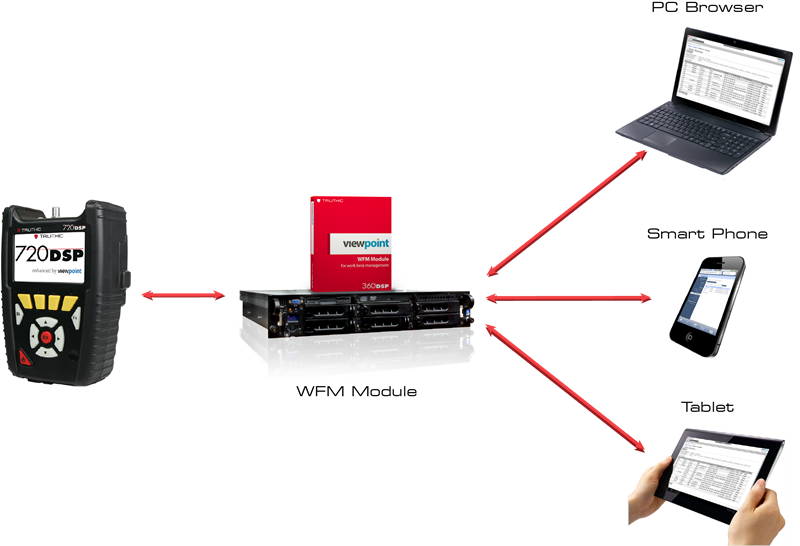 Combining DSPs in the field with the new ViewPoint WFM Module in the back office, managers can view the health of their entire system—in near real-time, for total RF installation management. Combining the 180 DSP, 360 DSP, 720 DSP & 1G DSP meters in the field with the new ViewPoint Integrated Server in the back office, managers now have simplified access to intelligent management tools for monitoring, assessing, and improving the efficiency of their total operation, while making it even easier to obtain consistent, repeatable results that give supervisors that birds-eye view of the field for Total System Management. By unifying an entire MSO’s field operations in one convenient dashboard, managers can easily verify compliance and quality throughout the entire plant, either by home, system, region, division, or any other attribute from a billing system. This simple and completely customizable integrated system of field analysis and reporting tools allows managers to watch over their entire field operations in one dashboard, comparing each location in the system, analyzing the overall health of their entire organization, and addressing concerns in near real-time. When activated in a 180 DSP, 360 DSP, or 720 DSP, the TraffiControl Plus feature provides users with the ability to troubleshoot the upstream in a bonded channel environment. This feature can be used to see impairments with ease and sort traffic from ingress within a bursty upstream. The CM Sweep feature (patent pending) for the New DSP family of field analyzers allows the cable modem to launch bonded upstream carriers back to the CMTS for use as in-band sweep points. This gives the operator the ability to finally sweep inside their upstream modem channels and look for potential gain and tilt issues that otherwise may be hiding. This is a software and hardware package that is used to connect a new DSP family meter to an iPad via Bluetooth for remote control of the meter during operation. This package includes a software activation key for the Bluetooth option on the new DSP family meter and a Class II Mini Bluetooth Adapter (v2.1) with a 10 meter range for speeds up to 3 Mbps. This option is compatible with the iPad and iPhones that have device tethering enabled by the service provider. When activated in a 180 DSP, 360 DSP, or 720 DSP, the Source Generator feature provides the ability to transmit continuous wave (CW), 16 to 256 QAM, or 4K/8K OFDM carriers within the return band from 5 to 85 MHz, with user-adjustable bit error injection. 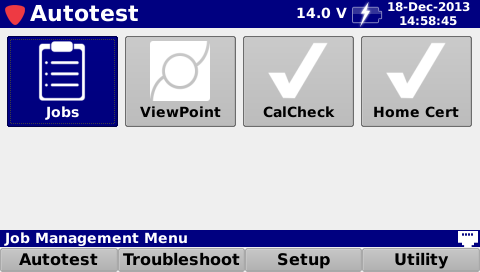 When activated in a 180 DSP, 360 DSP, or 720 DSP, the EVS feature provides users not only the ability to tune the meter to a downstream QAM channel and display its Error Vector Spectrum, and to reveal noise and ingress that may be present under the QAM channel, but also provides a method for troubleshooting upstream ingress and noise problems within active channel bands by seeing the ingress that is present “underneath” an upstream cable modem channel, or any bursty signal. 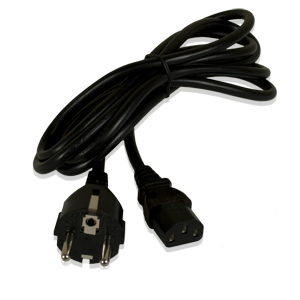 Vehicle power adapter for the 180 DSP, 360 DSP, 720 DSP & 1G DSP. The TLB-46 is a 46 MHz return lowpass filter. This high-quality low pass filter will ensure no forward signals are getting into the device this is connected to. This is most commonly used with any Signal Level meter. The 720 DSP is an advanced home & business certification meter specifically tailored for installation and troubleshooting, with advanced features such as built-in DOCSIS 3.1 testing, 1 Gigabit electrical/optical Ethernet testing, and N-Speed wireless survey. Featuring fast measurements and powerful troubleshooting tools, the 720 DSP comes equipped with all the tests an installer needs to measure both Analog (NTSC & PAL) and Digital (SC-QAM & OFDM) signals to ensure triple-play interoperability. The 720 DSP is an advanced home & business certification meter specifically tailored for installation and troubleshooting, with advanced features such as built-in DOCSIS 3.1, gigabit electrical/optical Ethernet, and N-Speed wireless testing. Featuring fast measurements and powerful troubleshooting tools, the 720 DSP comes equipped with all the tests an installer needs to measure both Analog (NTSC & PAL) and Digital (SC-QAM & OFDM) RF signals. The 720 TDR is an advanced home & business certification meter specifically tailored for service and troubleshooting, with advanced features such as a built-in Time Domain Reflectometer (TDR) and N-Speed wireless survey. Featuring fast measurements and powerful troubleshooting tools, the 720 TDR comes equipped with all the tests an installer needs to measure both Analog (NTSC & PAL) and Digital (SC-QAM & OFDM) signals to ensure triple-play interoperability. The 720 TDR is an advanced service meter specifically tailored for installation and troubleshooting, with advanced features such as built-in DOCSIS 3.1, Time-Domain Reflectometer, and N-Speed wireless testing. Featuring fast measurements and powerful troubleshooting tools, the 720 DSP comes equipped with all the tests an installer needs to measure both Analog (NTSC & PAL) and Digital (SC-QAM & OFDM) RF signals. The 720 DSP is an advanced home & business certification meter specifically tailored for installation and troubleshooting of advanced services, such as Gigabit electrical/optical Ethernet & N-Speed wireless access points. Featuring fast measurements and powerful troubleshooting tools, the 720 DSP comes equipped with all the tests an installer needs to measure both Analog and Digital signals and ensure triple-play interoperability. AC to DC Power Adapter & Battery Charger without AC Power Cable for the New DSP Family of Signal Level Meters. This is a standard AC to DC power supply (Input: 90 - 220 VAC, Output 15 VDC, 3.3 Amp). 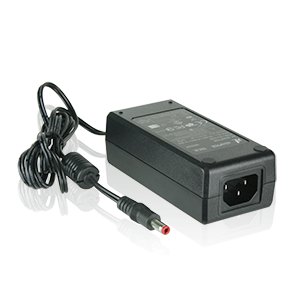 Can be used to replace the AC to DC adapter & battery charger that is included with the following products: 180 DSP, 360 DSP, 720 DSP & 1G DSP. 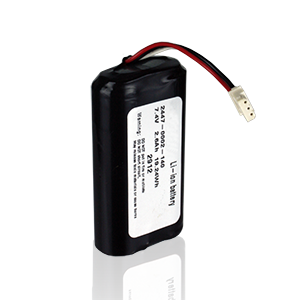 Li-ION battery for the 180 DSP, 360 DSP, 720 DSP & 1G DSP. The following number of batteries are used in each unit; 180 DSP (QTY 1), 360 DSP (QTY 2), 720 DSP (QTY 2) and 1G DSP (QTY 3). Each battery can be replaced individually. Replacement carrying case for the 720 DSP. Replacement touchscreen stylus for the 180 DSP, 360 DSP, 720 DSP & 1G DSP. This is the free ViewPoint Express configuration software for the 180 DSP, 360 DSP, 720 DSP & 1G DSP field analyzers. 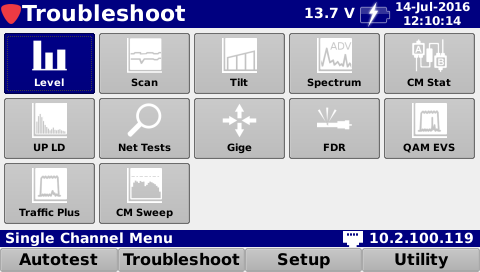 The ViewPoint Express software is used to manage device configurations including; Test Locations, Limit Sets, Channel Presets, Channel Plans, Autotests, Packages, Meter Settings, and Meter Syncing. Devices can be connected to the software via Ethernet. Additionally, the ViewPoint Express software includes an optional data management feature that captures data uploaded from field devices and allows you to view text and graphical displays of the measurement results and adjust live markers to further analyze the captured data. By default, the data management feature will be deactivated. A license key for this feature can be purchased and activated by phone, contact Trilithic Sales for more information. MINIMUM PC REQUIREMENTS: WINDOWS XP OR HIGHER (32 or 64 bit), MICROSOFT .NET Framework 4.0 and a Web Browser (Internet Explorer, Chrome, Firefox or Safari), 1 GHz Processor, 2 GB RAM, 100 GB Storage Space, Optical Drive, Video Adapter, Monitor, Keyboard and Mouse.